. :: GLOBAL CHAMPIONS TOUR OF CHANTILY, FRANCE ::. Well before their French got the home win they were waiting for in today's Equidia Grand Prix; Eric Van Der Vleuten was the very first competitor in the ring this morning on VDL Groep Cannelina . And although 50% of the 32 starters were clear & through to the jump off, he was never headed in the Prix Savelys. His grey mare, already in the money earlier in the week, was smooth & efficient round the turns in the timed phase & the clock stopped 38.79. None of the other 16 combinations could catch the Dutch pair, try as they might and Holland got another win at Chantilly after Harrie Smolders' yesterday. Eric's win was a good result for his sponsors VDL Groep, as well as for the GCT, because they are one of the main sponsors at GCT Valkenswaard in addition to their generous support of Eric. Eventually second was Edwina Alexander on a relatively new ride, dark chestnut mare Kisby, who had a time of 39.29 & third place went to another of this weeks earlier winners, Simon Delestre, riding Napoli du Ry. Their time was 39.59. Bernado Alves was fourth with Monaco GP winner Bridgit. The home side then dominated the Equidia Grand Prix, in which there was much more at stake than just the almost 12'000 Euro first prize. The show was also offering a car to the overall leading rider & other prizes to the leading lady and French competitor. Once again Uliano Vezzani whittled down the 44 starters to a more manageable twelve for the jump off with a twisting track that soon sorted out the order. The morning's winner Eric van der Vleuten was again first against the clock and he set a standard of 37.51 which was good enough for eventual fifth but certainly meant the rest had to use the distance to the last oxer to good effect. First Simon Delestre with Melodie Ardente clipped a second off the Dutchman's time and then to near hysterical cheers so did Roger Yves Bost. Bosty was riding the 'family, horse Nifrane de Kreisker who is good enough to win in Dublin last year and sweet enough to be ridden in a class by Bosty's daughter last week. 36.22 looked unbeatable but Michel Robert on GCT champion Kellemoi de Pepita had other ideas. At GCT Cannes a flat out gallop to the last in the GP had seen the last fence demolished twice by other riders but Michel was not deterred. Riding a perfect line on the curve to the last he did not take one pull and his great mare did not falter to charge through the finish in 35.33 to near hysteria from the French crowd. Only Harrie Smolders and Regina Z could now prevent a home side 1,2,3 and when the Dutch mare hit the second, Michel was a fitting winner. Harrie did end up as leading rider of the show and received a new Volkswagen though so it was not all bad for him! 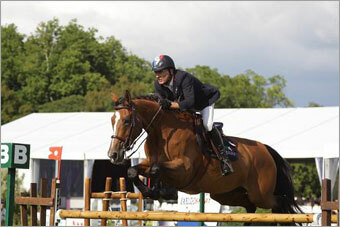 Edwina Alexander was best lady and Simon Delestre top French rider. As if the jump off was not exciting enough Michel then delighted the audience by jumping the prize table on his lap of honour! The Global Champions Tour now moves on to the eighth round on the Road to Rio and the Euro 1,000,000 bonus at it's home venue of Valkenswaard, Holland. Please see our website at www.globalchampionstour.com for details of this and all the results from Chantilly.